While many new PCs are USB only, the USB-Adaptor is designed to providing a simple solution for updating the serial ports on a TERN controller, RS232 or TTL, to communicate via USB. 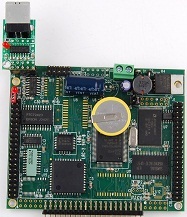 The USB-Adaptor includes an USB to UART bridge controller (CP2104, Silicon Labs) and a USB A-B connector. Royalty free VCP device drivers provided by Silicon Labs (www.silabs.com) allow, the USB-Adaptor appears as a COM port to PC applications. User can run Paradigm C++ TERN Edition via USB to debug and develop code for TERN controllers. Three configurations: USB232A, USB232B and USB-TTL. The USB-TTL interfaces with 5V TTL UART. The USB232A and USB232B interface to a RS232 port on TERN controllers. USB232A and USB232B are oriented 180 degree from each other. This prevents the USB-Adaptor from blocking other headers and connectors on the controller.